During yesterday’s United Airlines third quarter earnings call there were four things I wanted to highlight. I’m skipping over the stuff everyone else is covering about how airfares are up and how United thinks that they’re up enough to cover the increased cost of fuel. What I’m interested in is United’s plans for their products and what they think will happen to airfare in the future. United is the only airline that will not allow passengers on its lower fares to bring a carry on bag onto the plane. That means a customer who wants to bring a rollaboard will find that United is more expensive to do so, since Delta and now American allow it at their lowest fares. American began allowing basic economy customers to bring carry on bags on board back on September 5th because they found that customers were choosing to fly Delta instead over this issue, since Delta never imposed this restriction. However United remains undeterred. We closely monitor our relative share performance related to Basic Economy sales. We feel it’s important to differentiate the Basic Economy product. We continue to be pleased with the operational benefits of our bag policies. On Basic, we are happy with where we’re at. The way we designed Basic was carefully constructed to be, I think, a win for allowing us to segment our products, to allow us to compete effectively against the ultralow-cost competitors and allow our operation to deliver better results for everybody in terms of on-time departures. And it’s working as designed, and so we’re full speed ahead with where we’re at. …There are no plans to change any policies. Andrew Nocella, in his prepared remarks, highlighted the upcoming Los Angeles and Washington Dulles lounge opening timeframes. There are some great premium markets, and others where it’s tough to sell business class seats. The genius in United’s Polaris seat isn’t that it is industry leading. It isn’t. The genius is that they are able to offer fully flat seats with direct aisle access without taking up any more space on the aircraft than with their previous seat. 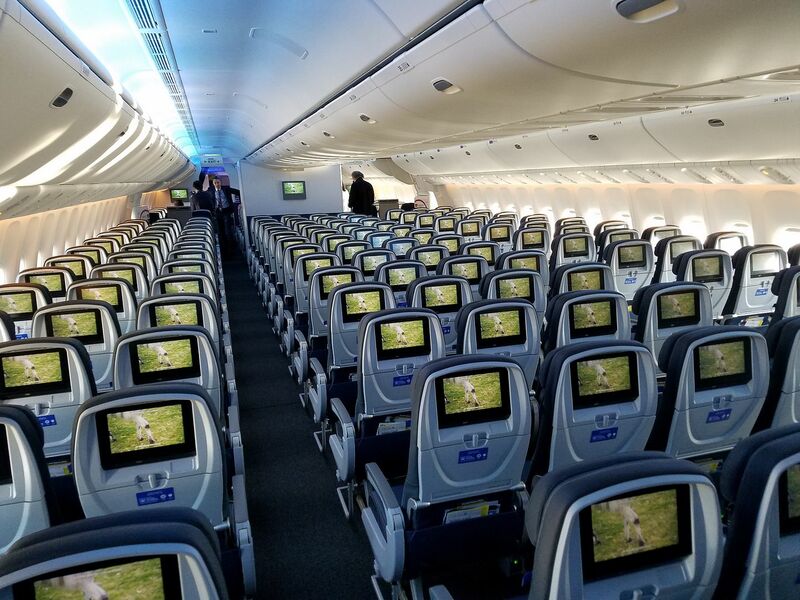 Since they’re squeezing more seats into less space, they have more business class seats to sell. 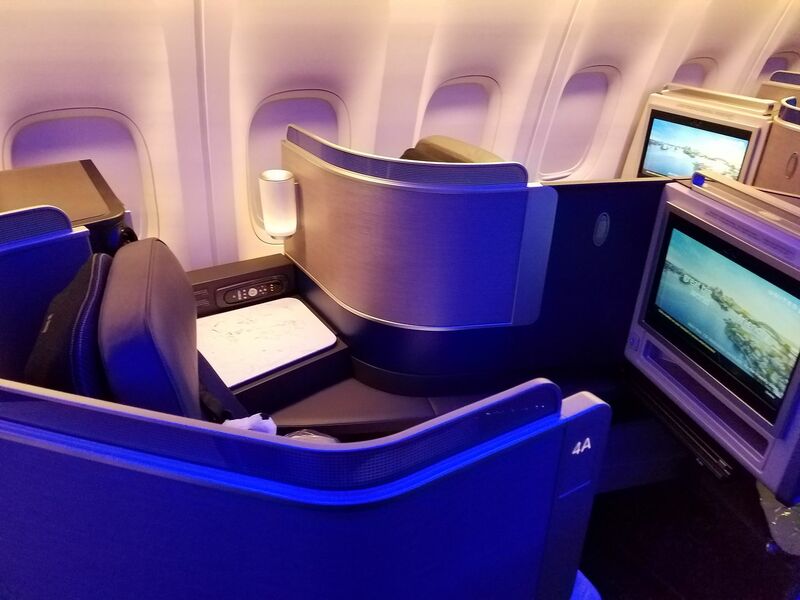 A United Boeing 777-200 offers 50 business class seats up front, compared to 37 at American and at Delta. And that may turn out to be too many for some markets (if they aren’t selling that many business seats and they’re making those seats available for awards and upgrades). [W]e spent a lot of time trying to figure out how many seats should be on our aircraft and how many seats should be in each and every cabin. United’s hubs are located in the best premium markets on the globe. They represent the majority of business traffic to and from the United States. It is something, I think, very unique to us. And so we think we have appropriately sized our cabins to accommodate the business class needs or the premium needs across the globe. So I think we’re pretty pleased with that, and we offer, I think, pretty large-sized cabins to make sure whether you’re going to China or London Heathrow, we can do that. We continue to look at the number of premium class seats we have onboard on all our aircraft given where our hubs are located. And I think, actually, we’ll have more to say on this in the future as we make sure that we have the right number onboard every single aircraft we have. Business travelers aren’t going to start doing video conferencing. People won’t stop taking vacations. They’re going to fly, at least that’s what United President Scott Kirby sees in the data. Almost any way you look at it, I think the price elasticity of demand for leisure travelers is about minus 0.7; and for business demand, it’s about minus 0.3. Another way of thinking about this fares in real terms are down about 50% in the last 30 years. It’s been great for consumers. It’s been great for people being out and getting to travel. It’s been good for the overall economy, but we have a very long way to go before we would get to a point where I think we need to worry about price elasticity impacting demand. Of course fares have fallen in real terms as passenger numbers have gone up. Kirby seems to think passengers would have increased their flying without air travel becoming more affordable. He’s staked out the bold claim that fares should be twice as high before. I think if anything United will be adding business class seats on some frames in its fleet. They have plans in the works to retrofit some 767-300ER planes to have 46 Polaris seats, up from the standard 30 in other 763s. The total capacity of those will actually be lower than their 737-900/ER. Scott Kirby is not someone who should be running this airline – if they want to be recognized as a “good” brand. Look at what Delta does. What I want to know is: who are the pax that don’t need or have carry-on luggage for their final destination? I can think only of a three isolated groups: college students returning home, retirees with second homes and a full wardrobe and bathroom at each location, and businessman going for a day trip. And I cannot conceive of a company being so cheap that they stick their employee in BE, especially when the cost to fly with a carry-on in E can sometimes be equal to or even less than BE. I have always wondered why UA’s fleet is so inflexible as to the proportion of seats in Business. Whilst I recognise that airframe rotations make it very difficult, I cannot understand why they don’t have some High J and some Low J configurations and route them accordingly – and the converse would apply in that the Low J configurations have high Y, thus being suited to leisure markets, and the HIgh J/Low Y configurations can be put on Business markets, thus squeezing the Y fares in those markets. I do know that UA has many different aircraft types, but the ratios of J to Y in them is not nearly as variable as it should be. There are companies that don’t let their employees accrue their own frequent flier miles, so yes there are companies so cheap they make their employees fly basic economy. Interesting statements from Kirby about ticket price. I remember a day when flights were so expensive, admittedly a while ago, that companies were determining whether it was better for employees to drive than fly. I remember one article stating that if more than one employee had to fly to a location less than a four hour drive, it was better for all of them to drive there together. This is a different day and age though. When United lower their business cabin seat count that’s when I switch to another airline. Now that I think about it- the perfect United ploy would be to “thin the ranks” of 1K folks (with the recent change to PQD) and pretend it’s a perk because all the remaining 1K’s will get upgraded more frequently….and then a year later start taking out business seats… Sigh. BE works well for people who don’t care about their seat and who can check luggage for free. For both are critical factors (I want an E+ aisle seat and never check luggage) so BE will never be an option. As UA doesn’t really want people to buy BE the better question is whether BE is still impacting their profitability ($100 million lost in one quarter is not chump change). If they are filling the back of the plane then maybe not an issue until the next recession hits. UA is introducing a high J config on many of its 763s – the first are the 3 ex Hawaiian birds in maintenance right now. Whether that means seats taken out of another fleet type – not clear. But unlike AA which just did cuts – UA is at least making on fleet type ultra high J.